On August 28, 2017, I attended the August board meeting of the Rockwall Central Appraisal District. The posted agenda for this meeting says nothing about a “public hearing” to take input from citizens concerning the Appraisal District budget. Additionally, Section 6.06 of the Texas Property Tax Code requires the Secretary of the Appraisal District Board to serve the Mayor, as the presiding officer of a city, with written notice of the date, time, and place fixed for the “public hearing”. I never received any written notice from the Secretary of the Appraisal District Board of any such “public hearing”. Had I not read the notice in the newspaper, I would not have known of the public hearing. I pointed this out to the Board but no action was taken to delay the budget hearing until proper notice was served and properly posted on the agenda. At the hearing, Chief Appraiser Davis informed the Board of Directors that she had once again made a “small” mistake in the proposed budget but that it was corrected when the City of Rockwall’s Finance Director brought it to her attention. The mistake was actually in the amount of $173,399. I pointed out to the Board that the Chief Appraiser has made mistakes in her calculations for the past three cycles and each time they were only acknowledged after Rockwall’s Assistant City Manager, Mary Smith, brought them to the Chief Appraiser’s attention. One such mistake cost the City of Rockwall two cents on our tax rate. I then registered my concern not only with the total budget increasing by 15%, but with the individual raises that were given to employees. It seems irresponsible to give a number of the district employees raises in salaries that exceed 12% in one year. Please remember that we allowed for raises of 4% for our city employees with a 5% increase for police and fire employees. We have no control over the appraisal side of the District budget, except to object by resolution. These costs are passed directly to the taxing entities in a pro-rata allocation. We do have control over the collection side of the district’s budget since the district collects taxes for us under a contract for services that we can terminate. It’s interesting that on the collection side of the District budget, employees received only a 2.9% raise in salary. Four appraisers were given salary increases of 13%, 12%, 12% and 11%. One senior clerk was given an increase of 27% over the last two years. The reason given by the Chief Appraiser for these increases was she needed to keep good people. When questioned by County Judge Sweet as to how many employees she has lost due to salary concerns since she has been at the District she replied, “None”. How do we tell our police officers, firefighters and other City employees that their hard work and dedication to our City is valued less by their City than an appraisal district employee is by the Appraisal District? A comparison of Rockwall County with Hunt County, which has roughly the same population, reveals that Rockwall County has 42,516 parcels of property that are appraised by the District at an appraisal cost of $45.94 per parcel. Hunt County which has 68,208 parcels that are appraised by their appraisal district are appraised by their district at a cost of $33.90 per parcel. I question the efficiency of our District employees as compared to the Hunt County Appraisal District employees. The Chief Appraiser’s answer to that question is to add two new appraisers in this budget cycle. I might add that the legally required notice stated she was only adding one additional employee while the budget reflected two new appraisers. The law also requires the Chief Appraiser to set out any capital spending that will be proposed during the budget year. It is interesting to note that two weeks after the adoption of this budget by the Appraisal District Board, the City received an email from the District wanting to inform us of a major expansion in the Appraisal District building. The Rockwall City Council has passed a resolution in opposition to the Appraisal District Budget. 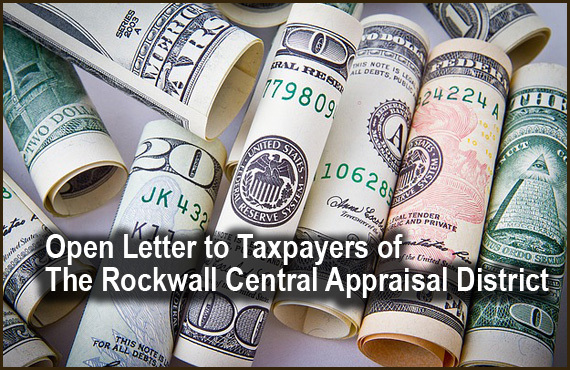 I encourage all the cities in the Rockwall Central Appraisal District to do the same. The legislature included in this statute the ability of cities to object to runaway spending budgets of appraisal districts. Until cities object to such spending these boards will have no reason to stop spending taxpayer funds in this fashion.